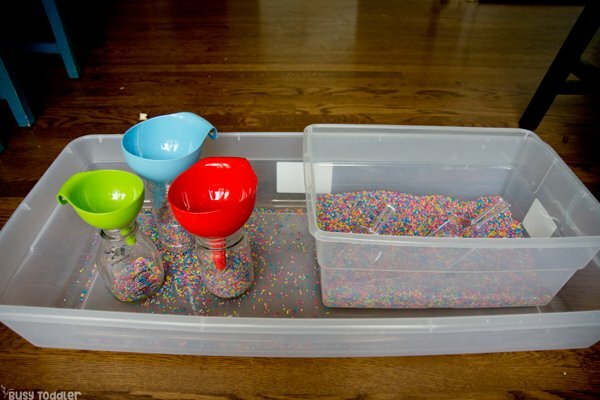 Ready to make a quick & easy sensory bin? Just grab the funnels and rice! 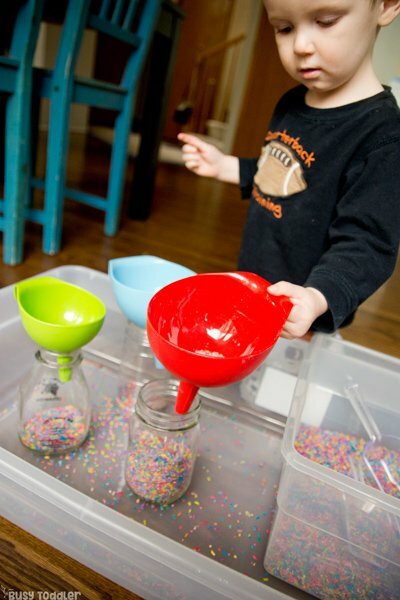 Sensory bins are important. You might think “Yeah, important in making MESSES” but hey hey now, hear me out. 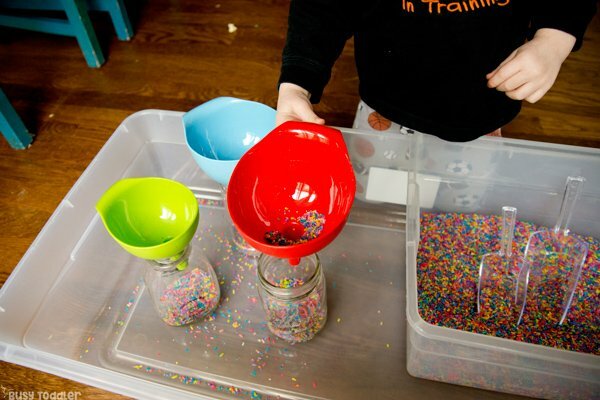 I know sensory bins can give people the willies…believe me, I don’t need more messes in my life either. 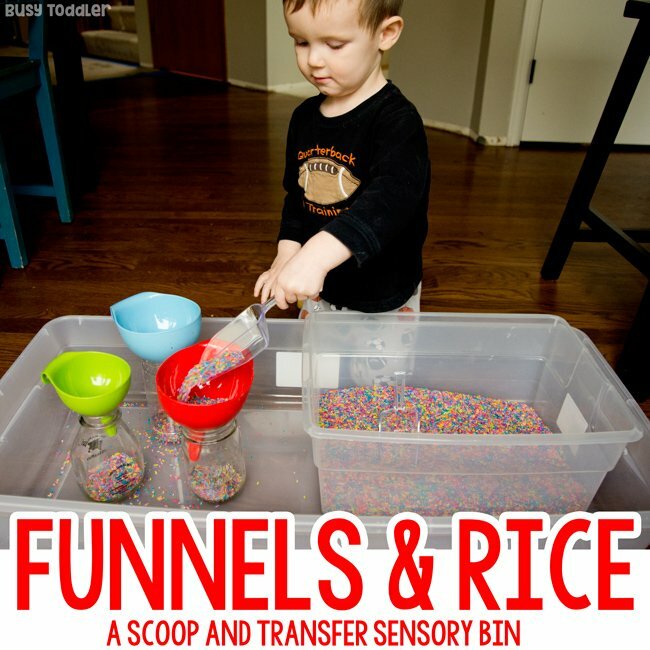 But trust me, simple sensory bins – like this funnels and rice set up – do a whole lot of good for our kids. 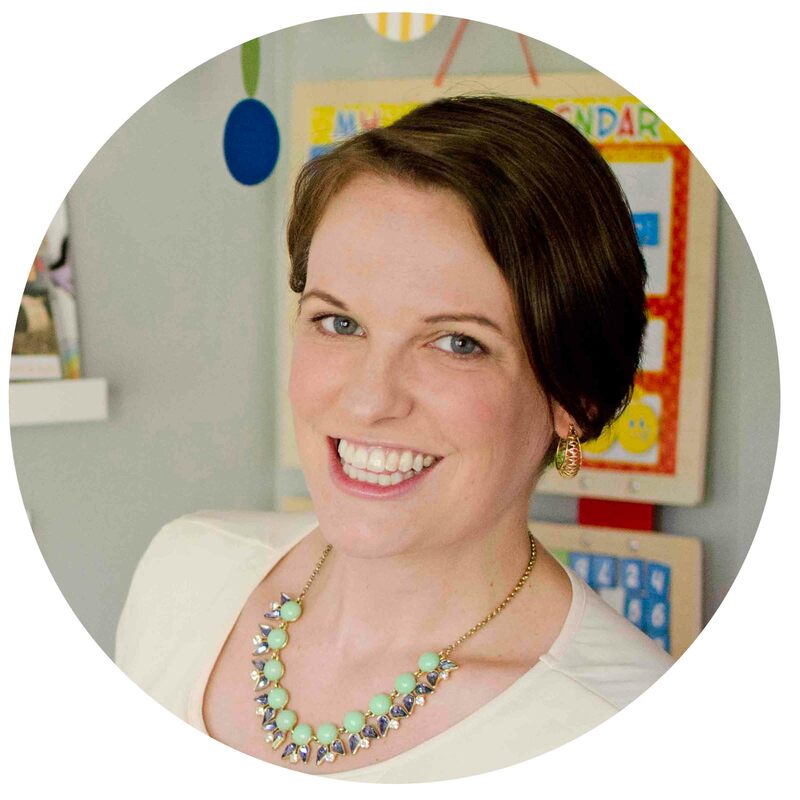 RELATED: Wondering how to set up your first sensory bin? Check out my tips and tricks. What good can come from funnels and rice? I know it doesn’t look like much. But this little bitty sensory bin is worth it’s weight in gold (and well worth the sweep up of rice at the end). Because my son (28 months old) is learning so much doing this bin! Look carefully… do you see it? He’s learning about capacity – how much can a jar hold? He’s learning to transfer – a skill he will use all his life. He’s learning to use simple tools – a scoop and funnels. 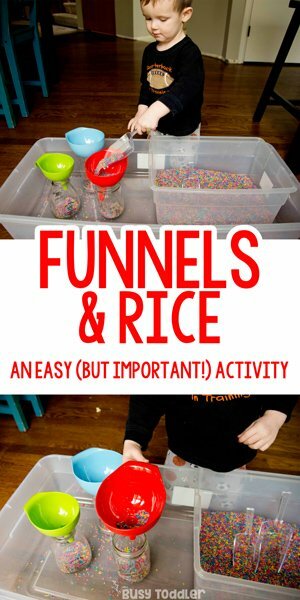 In this easy funnels and rice activity, I’m giving my son space to question, reason, and think. 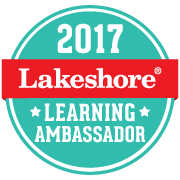 It’s a chance to just be immersed in learning. 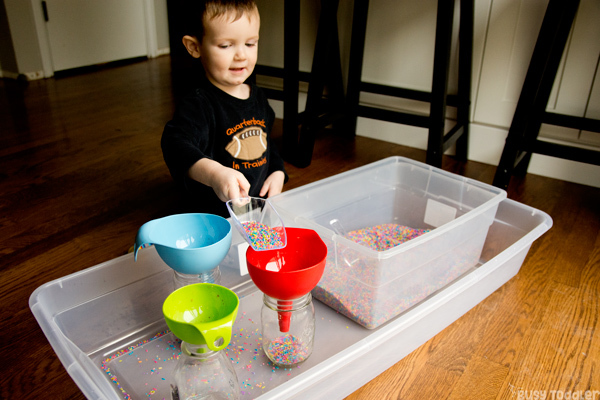 RELATED: What are kids learning from sensory bins? Find out HERE! I dumped my rainbow rice (seriously the easiest stuff to make) into a container and added in a bunch of scoops. I set that inside a larger container – the goal here is to contain the spills. You can also just put a big blanket or beach towel down to catch any mishaps. 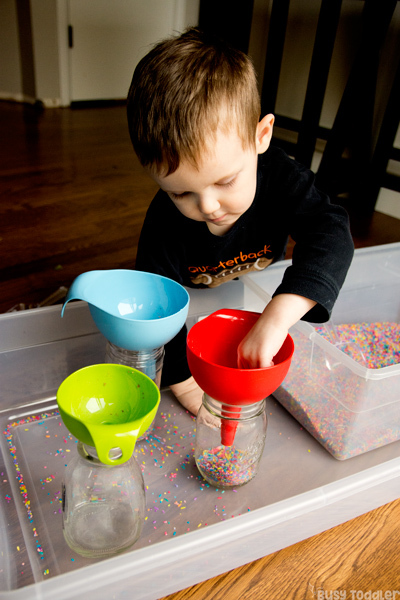 I put in some jars and funnels, and started by modeling the process to my son. 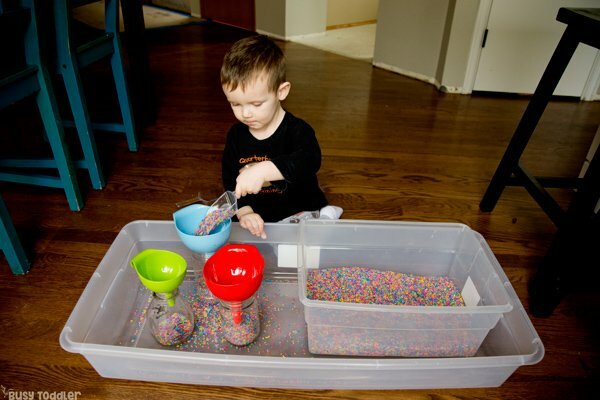 RELATED: Curious how I taught my kids to keep sensory bins tidy? Let me show you! You have to model how to use the scoop and the funnels to get things started. I’d also recommend staying close for the first time the funnel gets clogged. That’s a fun problem solving moment that they have to work through. Help them – but don’t do it for them. Be their learning assistant and remember: the more they can figure out on their own, the better. Sometimes, my son would move the funnels around, take them off, explore in a different way than I had anticipated. This is HIS activity, not MINE and if he needs to change the activity that’s ok. I’m just fine with that! RELATED: Check out this awesome tip for siblings and sensory bins! 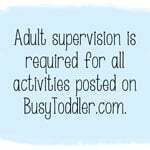 …but it is such an important sensory bin. 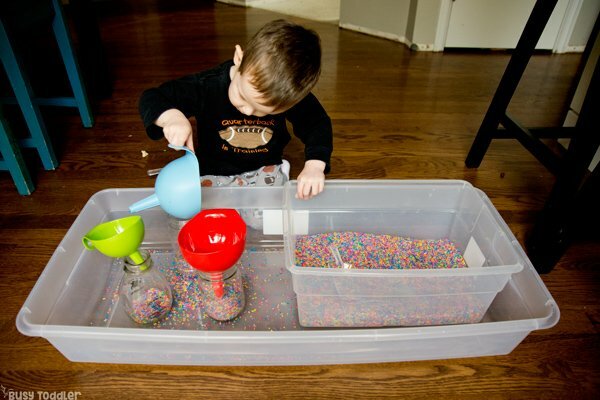 What better way to let our children grow and engage with the world around them than through sensory bins? This was such a winner for my son! 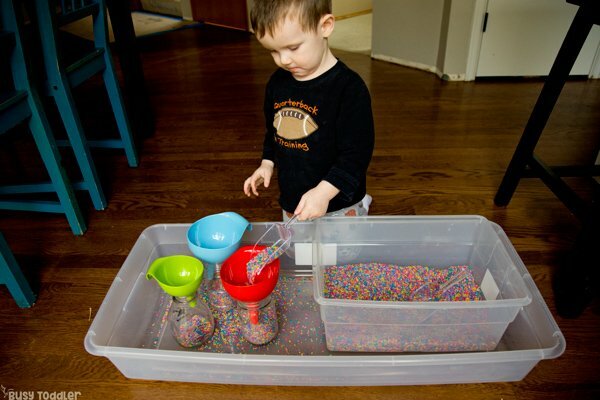 When will you make a sensory bin for your toddler?